Trekking in October has its own merits and demerits. For one, it is extremely sultry, and therefore one must carry all the necessary provisions, like a hat, lots of water, and nutritious stuff to eat. If you can carry a few extra kilos and bear the hot weather, you will be surprised for October also offers a great chance to stand on top of the hill under azure skies, to share this peak with your beloved friends, and to see the results of monsoon on one hand, and that of the increasing intensity of sun’s effect on the other. October is a season of rapid transition. I call it the second spring of the tropics. There are plants that are flowering while some are drying out. And dry patches are quietly spreading its cracks outwards on the plateaus. Something that one observes all monsoon suddenly becomes quite apparent by the end of it, perhaps because they are last of their kind to be seen during this season – the last blossom of monsoon. It begins as the wetness in the air starts to weaken, and the dryness grips the land like frost. The most startling, and one of the last troupes of them, are the Utricularia, commonly called Bladderwort. It is a unique plant in the sense that they’re carnivorous – but amusingly, also depend on insects for pollination. These amazing flowers of Utricularia purpurascens stand straight up on tender spiraling stems, signaling insects to come. A few inches below, on the substratum saturated with water, are small bladders that, when invaded by an invertebrate, close down engulfing them. These bladders are too small though, and much of what they catch is barely visible to the naked eye. What’s even more interesting is that this genus comes in an array of sizes, but retains most of the features of the Utricularia. Some flowers barely measure less than 5 mm, while other are over an inch in length. The habitat is shared by another plant which blossoms toward the last days of monsoon – Exacum pumilum, commonly called Little Persian Violet. This beautiful little herb adorns the brilliant greens with their deep violet flowers. Although common, they are some of the most ephemeral plants of the region, choosing this specific period for calling all the insects for their services. Several other flowers in the shade of violet, Smithia purpurea, Ipomea sp., Impatiens sp., and Argyreia sp. also dot the landscape. The inflorescence of this plant, again, is purple-violet in colour, and stands out strikingly from the green abounding it. It is delightful to sit by them and observe flies, bees, moths and butterflies go crazy after its nectar and pollen. You may have noticed a trend in the colour these flowers wear. It falls in several shades of violet. This is where things get even more interesting. I find this colour of flower, which is the last in the spectrum of light, hard to comprehend. My eyes show the colour differently than my camera, and so all the colours you see in the photographs are in fact slightly different, and this colour complex is called purple-violet. Now, why are there so many of the plants bearing purple-violet flowers, I wondered. There must be something about it that most of the flowers seem to adorn it in monsoon, and especially towards the end of it. It is a known fact that some flowers are so coloured to send out signals to attract the attention of pollinators in a competitive market, and these pollinators are attuned to particular traits of flowers to obtain food. As per a research article (fortunately freely available online), by Raine and Chittka (2007), the inexperienced bees of a species of bumblebee (Bombus terrestris) of Europe showed a stronger bias towards “most rewarding flower colour” that is violet, in the local flora. The colonies with the strongest bias for violet brought in 41% more nectar than the colony with the least strong bias. It should however be noted here that violet flowers in their study area produced more nectar than blue flowers – which was the next most rewarding flower colour. ﻿﻿From this study, I deduced two probable theories: that like the most common bumblebee of Europe, other insects in Sahyadri are also attracted to this colour because these flowers, like in the study site, produce more nectar than others, and are hence more common and diverse. Or, that the purple-violet flowers are so coloured because insects are simply more attracted to purple-violet colours, irrespective of the fact that the nectar content in them is higher or lower than, say, the yellow flowers which are also abundant during post-monsoon period. It is worth noting here that although equally common, yellow colour is adorned by very few species of plants – Smithia sp. and Senecio sp. being the most common, and white is also adorned by very few species such as – Kaempfeira scaposa and Pecteilis gigantea, while I saw purple-violet adorned by at least six to seven species of plants. Unfortunately I could not find many studies seeing the significance of flower colour and its probability of getting pollinated by insects (entomophily). Since the insects see in ultraviolet, it will be interesting to look at the colours they favour, which will help us add another feather to the cap of understanding the reason for flowers to adorn such vivid colours. 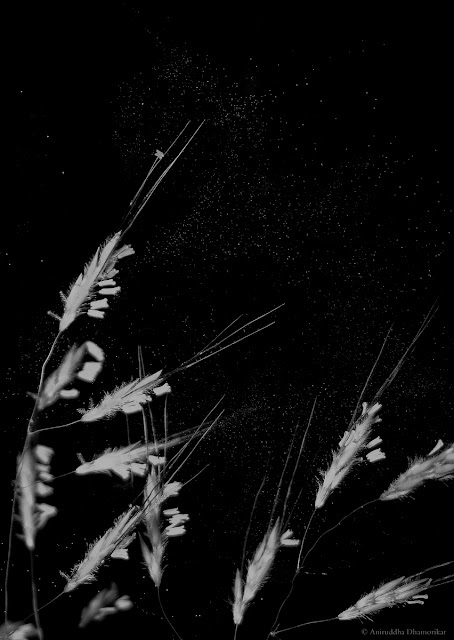 Grasses are commonly pollinated by the element of wind (anemophily), and therefore you will see their anthers freely suspended by a filament, as in the above picture. These anthers carry millions of tiny pollen, and are akin to bags hanging up-side-down. These bags of gold are therefore easily exploited by the gold-hunters, or the pollen hunters – the bees, during anthesis (i.e. when the flower is fully open and functional). Grasses, especially which we consume, are still considered to be predominantly anemophilous, however researchers have for many years recorded insects from bees to tiny thrips assisting in its crosspollination. The bags containing pollen opened at the touch, much like they would during a strong wind, and the pollen flittered out of it like dust of gold. This is partly zoophily and partly anemophily at work – because although I disturbed the pollen out of their containers, it was the responsibility of the wind to take them to their destination – which is, if you see the purple feathery-structure on top of the flower in the above picture, the stigma of another individual. 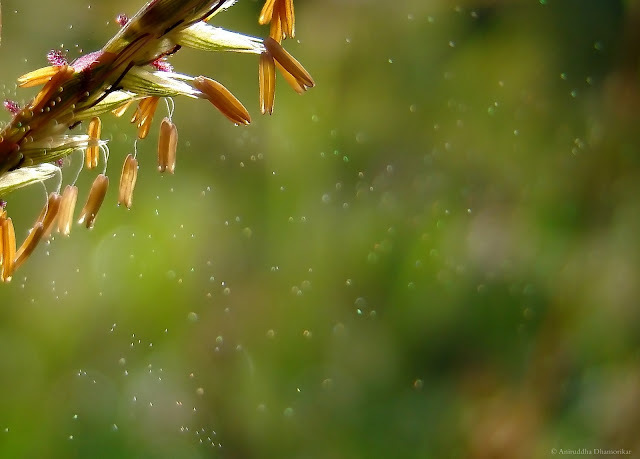 I observed that the pollen only come freely out of the spikelet when the anthers lose a little of their moisture. The colour of an empty anther is different from a filled one. And the amount of pollen from species to species varies greatly, some form large puffs of smoke while others carry heavy pollen which literally sprinkle down like dust when the wind is still. And as we trek along the Sahyadri watching purple-violet flowers and smoking grass (or grass that smokes) we reach the top which is often flat ground carrying ruins of the fort that stood in an age long gone by. Over here too lie a few wonders which one must seek if you happen to study nature. Every fort carries a waterbody at the top, or the way to the top. Some of these contain water throughout the season, and some that are only full during a specific season, here monsoon, are called vernal pools. They carry an extremely unique ecosystem and are one of the least studied and underestimated, and one of the most threatened, ecosystems in India mostly because of our sheer ignorance. These pools are inhabited by a number of organisms – from microscopic algae to invertebrates to fish and frogs, and are a favourite site for birds to rest and nest. Perhaps the most common invertebrate of these ephemeral pools are the Odonates. Dragonflies as large as Annax immaculifrons, to the smallest of the Sahyadri – Agriocnemis pygmaea, all call it a home when young. On a trip to Korigad, which has a large vernal pool not more than six feet deep, we found something natural but extraordinary. A band of fairies or fishes? Like little fairies, or fishes as you see it, they glided into the waters a few inches below the surface. On getting a better view of this pod of creatures, I put their numbers anywhere between thousand to million. It was something I had never seen before, in such large numbers. A quick photo taken from a distance revealed that they had stalked eyes and tiny antennae, and they were continuously flapping in the same place. As a group of these approached closer, I was pleasantly surprised to find one of the most enigmatic and extremely ephemeral animals that call Sahyadri their home, but are completely unheard of outside the few groups of people – the Fairy Shrimp, probably Streptocephalus (dichotomus). It is their sudden and “bountiful” appearance that fetches the name Fairy Shrimps, as quoted by Amutha, Subhramanian and Bupesh (2007). They are under an inch in length, carrying orange coloured cercopods. Their numbers were so huge at the vernal lake in Korigad that it snaked under the water for several meters, much of which was invisible in the haze. Fairy Shrimps belong to the order of Anostraca, and are known for their rather interesting, up-side-down life. They are called the most archetypal crustaceans of the vernal pools, swimming as if gliding effortlessly by the movement of their phyllopodia, filter-feeding on the suspended organic matter. Their lives are short, lasting only about a fortnight, in which they breed and lay eggs. These eggs are drought-resistant and can last from months in case of some, to years or even decades. One may call them insignificant in this big, big world, but these Fairy Shrimps are also an indicator of a healthy ecosystem, and are a source of nutrition to many waterfowls and fishes around the world. They are a flagship species of the vernal pools, a habitat about which is so less known, there is no legal protection offered to it, albeit being a prime hotspot for many unique and endemic species to flourish. I wasn’t able to find information specific to the fairy shrimps of Sahyadri, but there are a few passing records I found in Rocky plateaus: Special focus on the Northern Western Ghats and Konkan by Aparna Watve, by Padhye, Ghate and Pai (2011), and a detailed study on Streptocephalus dichotomus by Amutha, Subhramanian and Bupesh (2007) in Tamil Nadu. We’ve reached to the top now. There is no relief as that provided by a body of water, cool and rippling, where you can sit by observing such flickering life, skittering frogs and their tadpoles. The last band of clouds that are holding onto the mighty Sahyadri provide a spectral display of light and shadow. This world seems disconnected, almost lamenting the age gone by when man treaded it without plastics and other polluting objects. I have sat here for many hours, observing ripples starting in the middle of the pool and spreading outwards, dragonflies fighting over the best perch, and frogs leaping from the banks. It is a place of solace and stupor. In places of such historical significance, there are stories told by those who live at its foothills. Such stories have been passed on for generations, some of whose families have also served the Kings in the years of yore. The stories of spirits and other such supernatural entities are ripe and easy to pick. A wind fanning the leaves of Banana, the rustling of the grasses, and the rhythmic love-notes of Cicadas, when heard walking alone in these lands, deviates ones thoughts towards the eerie. One may lose his tracks during such an event. Although I’ve never experienced the supernatural, my friends have communicated with old – and wise – entities in the form of mavlas (Maratha soldiers) and elderly folk, walking barefooted in the forests at night. The Sahyadri are full of them, I’ve heard – and the imaginative carvings done centuries ago nag at our fantasies. This photographed artifact lies near a ruined entrance to Mahuli Fort, and resembles a big horned cat with long whiskers, a trident-shaped-tail, and wings much like a griffon. Many forts also adorn carvings of the monkey god Hanuman, the goddess Lakshmi, and Ganesha. Even today they are worshipped by the villagers and fresh flowers are offered every morning. This diversity of artifacts (except that of gods), unfortunately remain from being explored and described, and often go undocumented. If you’ve ever walked alone in the forest, the thing that one fears most is the unknown that may lie on a bend. Some patches in the forests are devoid of sounds, even the wind does not blow here. In such parts you feel like you’re being watched. We’ve had such experience before, and found the eyes that did not move – even after it had been more than a hundred years. These eyes belonged to the stones, and remain there without ever blinking. Fortunately for me it looked very wise and happy to see us. Now that you’ve travelled this far, dived deep into the lives of little animals and fantasies of the people that dwelt here, it’s impossible to not stand on the edge and look beyond. Stand and gaze. Close your eyes, and let the depth of the landscape consume you. With this image captured by your eyes forever, you will find the following week go by fairly easily. I did. Superb as usual. How do you manage to know the names of so many animals / birds / insects? Hello Bernard, there are many field guides and online forums available for referencing flora/fauna. You may want to check http://www.sahyadrica.com/2012/05/afoot-exploring-northern-western-ghats.html where I've given a non-exhaustive list of resources (in the Appendix section) in India. Hi. Found this by chance. Very nice article and beautiful pictures- can imagine efforts going into it. Seen Kori top after a long time. Hope you writ more. BTW, now we know a little more about fairy shrimps- incl. the fact that there is a new species of it swimming on plateau pools in Satara. Check papers by Dr. Sameer Padhye.